[ Sir Nicholas Conyngham Tindal, Chief Justice of the Court of Common Pleas. ] 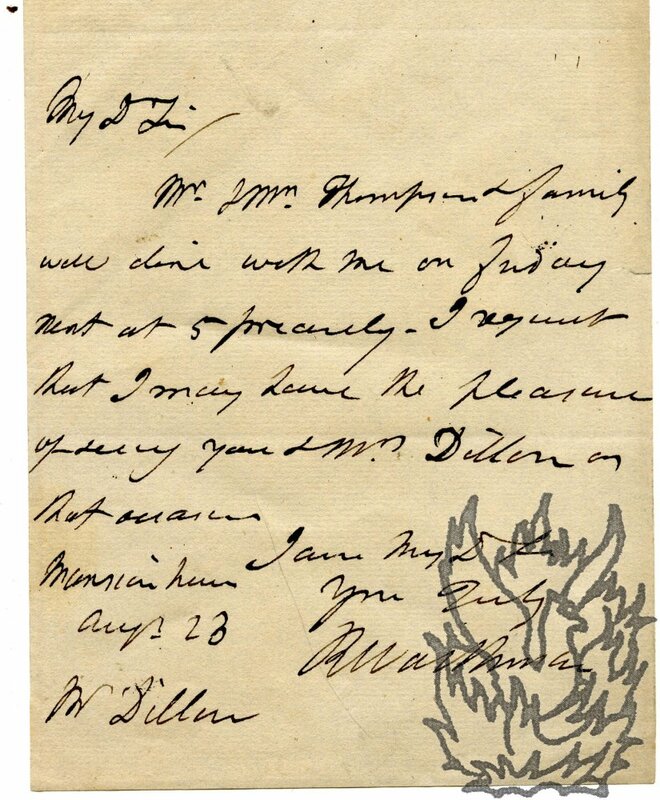 Autograph Letter in the third person to J. L. Adolphus, regarding 'the proof Sheet of the judgment of the Court of Exchequer Chamber in Wilson v. Fuller'. 1p., 12mo. In fair condition, lightly aged. Laid down on a piece of card cut from an album. Reads 'The Lord Chief Justice Tindal returns to Mr J. L. Adolphus, the proof Sheet of the judgment of the Court of Exchequer Chamber in Wilson v. Fuller. He has made no other alteration therein than the addition of a word, thinking the Judgment expresses very clearly and faithfully what was delivered by the Court'. See both men's entries in the Oxford Dictionary of National Biography. Scarce: no other copy traced, either on OCLC WorldCat or on COPAC. 16pp., 12mo. With an additional two central pages of illustrations on shiny art paper. Stapled and unbound. In fair condition, aged and worn, with light pen mark at foot of cover. A final page headed 'A Sunset Abroad. | (From a Tourist's Diary)' is preceded by eight numbered sections: 'List of Members, 1931' (pp.3-5); '1931 Chronicle' (pp.6-9); 'Other News', 'Obituary', 'The Old Albemarlian Association', 'The Year at Albemarle' (pp.11-14), 'Games Notice' and 'Editor's Notes'. On the final page is an appeal for 'St. Both letter and receipt from Eaton Rise, Ealing. W. [London] 31 March and 12 May 1900. For more information on Common, see his entry in the Oxford DNB. Both items on aged and worn paper. ONE: Typed Letter Signed. 31 March 1900. 1p., 4to. 'I bought a gross of balls of Hunter and paid for them on the understanding that I should take them as I wanted them'. He has a rough idea how many he has had, and will be 'able to say exactly when I look in my locker'. He ends by asking the firm to refer to Hunter's books regarding the matter. TWO: Typed Receipt, signed by Common over two red Inland Revenue penny stamps. 12 May 1900. 1p., 4to. 'Received of Messrs Emmerson & Co.
[The Campaign for Nuclear Disarmament.] Sturdy brown suitcase belonging to an anti-nuclear protester, containing numerous pamphlets, stickers, a traffic lamp from Greenham Common Air Force base, and other material. Twelve pamphlets from 1980 and 1981, one from 1977, and two from 1979. With another item from 1988. A powerful and evocative artefact, and a decided museum piece, mainly centring on the year 1980 and 1981, significant years in the movement's history, with a quarter of a million people marched through central London in support of CND in 1981. The collection includes a copy of the 1980 government pamphlet 'Protect and Survive', and E. P. Thompson's celebrated riposte of the same year, 'Protest and Survive'. The collection is in fair condition, with signs of age and wear which enhance rather than detract from its impact. [Printed item.] The Laws relating to Grammar and Common Schools, in Cities, Towns, and Villages In Upper Canada; Together with Decisions of the Courts, and other Information. Toronto: Printed for the Department of Public Instruction for Upper Canada, by Lovell and Gibson. 1860. 88pp., 12mo. In green printed wraps, with front cover carrying the title, which continues: 'Edited under the authority of the Chief Superintendent of Education, with Notes and References, by J. George Hodgins, LL.B., Deputy Superintendent.' In fair condition, lightly aged and worn. With shelfmark and labels of the Board of Education Reference Library, London. Only four copies on OCLC WorldCat. Album of poems by Captain William Gamul Edwards of The Cedars, Bromley Common, Kent, both original compositions in his autograph and cuttings of poems published by him, mainly under the pseudonyms 'W. G. E.' and 'Gamul'. [The Cedars, Bromley Common, Kent.] Dated from between September 1835 and February 1880. 146pp., 12mo, in autograph, almost entirely consisting of poetic compositions, with numerous emendations; with a further 35 cuttings of poems laid down (33 of them by Edwards) and another two cuttings of another two poems loosely inserted. Also loosely inserted are two poems (totalling 7pp., 4to): 'To Ill Health', dated September 1835; and 'The last hope', 28 December 1869. In contemporary dark-green crushed morocco binding, gilt, recently rebacked by Ipsley Bindery with new enpapers. All edges gilt. [Printed parliamentary paper.] An Act for Inclosing Land in the Parish of South Moreton, in the County of Berks. 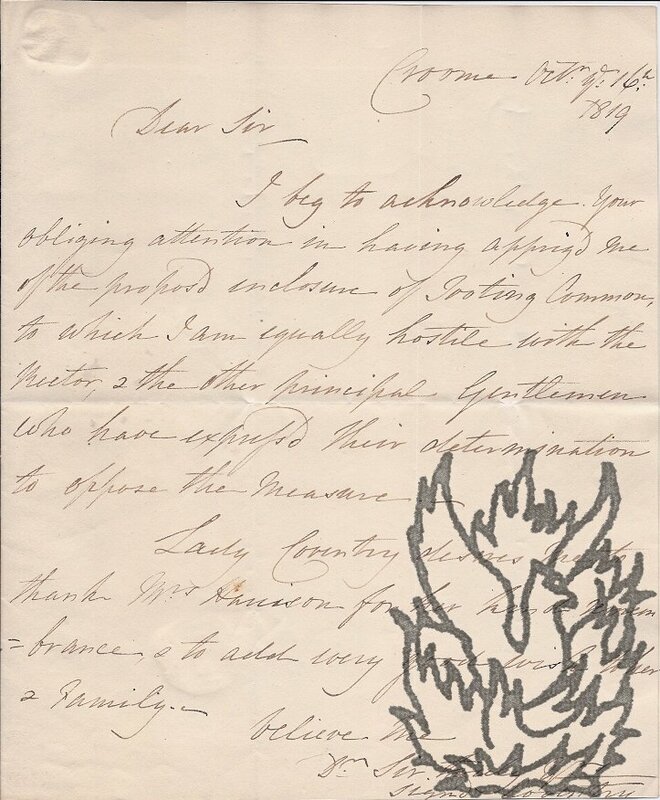 [Royal Assent, 8 May 1818.] 58 Geo. III. Sess. 1818. 'Ley & Jones, House of Commons.' 1818. 35 +  pp., 8vo. Stitched and unbound. 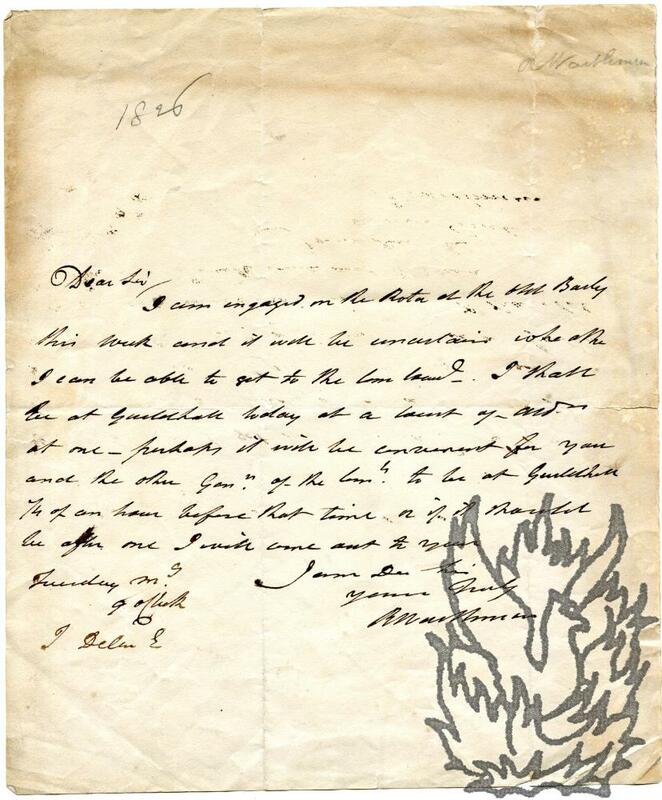 Well printed, on good laid paper, watermarked 'IPING | 1813'. In fair condition, on aged paper and lightly-discoloured paper, and folded into a packet, showing the title on the reverse of the last leaf as quoted above. The drophead title reads: Sess. 1818 - 58 Geo. III. | An Act for Inclosing Lands in the Parish of South Moreton, in the County of Berks. Manuscript minutes and resolutions, taken by Richard Pryce, of a meeting held in 1833 at the Red Lion public house, Aston, Bampton, Oxfordshire, to oppose the enclosure of common land in the parish; with copies of letters to Charles Leake and others. Dated from the Red Lion public house, Aston, Bampton, Oxfordshire, 12 and 16 November 1833. Folio, 7 pp. Stitched into orginal brown wraps. In good condition, lightly dogeared and aged. On Britannia laid paper watermarked 'WE | 1833'. The minutes of the first meeting, and the copies of the two letters, are all signed by Pryce as chairman. The four pages of the minutes of the first meeting are headed 'Red Lion Aston Bampton Oxon. Novr 12th 1833'. 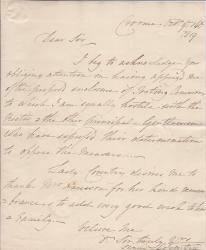 Autograph Letter Signed by George William Coventry, 7th Earl of Coventry, to Thomas Harrison, egarding the enclosure of Tooting Common. Together with franked envelope bearing Coventry's red wax seal. 4to, 1 p. Eleven lines. Text clear and complete. Good, on lightly-aged paper. He thanks him for having 'appriz'd' him 'of the proposed enclosure of Tooting Common, to which I am equally hostile with the Rector, & the other principal Gentlemen who have express'd their determination to oppose the Measure'. Lady Coventry joins him in sending 'kind remembrances' to Mrs Harrison and her family. The franked envelope is a sheet of folded paper, bearing Coventry's red wax armorial seal in good condition, and postmark. It is addressed 'Pershore Octr. Seventeen | 1817 | Thomas Harrison Esqr. 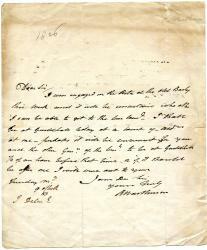 Autograph Letter Signed ('R Waithman') to 'J. <Delan?>'. 4to, 1 p. Text clear and complete. On aged, sunned paper, with some chipping and closed tears to edges. He may not 'be able to get to the Com[mon] Coun[ci]l' as he is 'engaged on the Rota at the Old Baily this week'. He will be at a Court of Aldermen at the Guildhall at one o'clock, and if the recipient and other members of the Council cannot be there a quarter of an hour before, he will 'come out to you'. 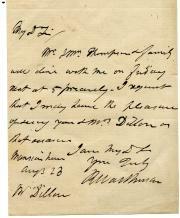 Autograph Letter Signed ('R Waithman') to 'Mr Dillon'. 12mo, 1 p. Good, on lightly-aged paper. Gives the date of a dinner with 'Mr. 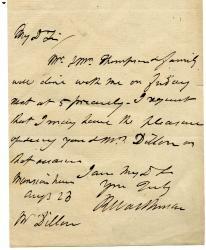 & Mrs. Thompson & family', to which he invites Dillon and his wife. 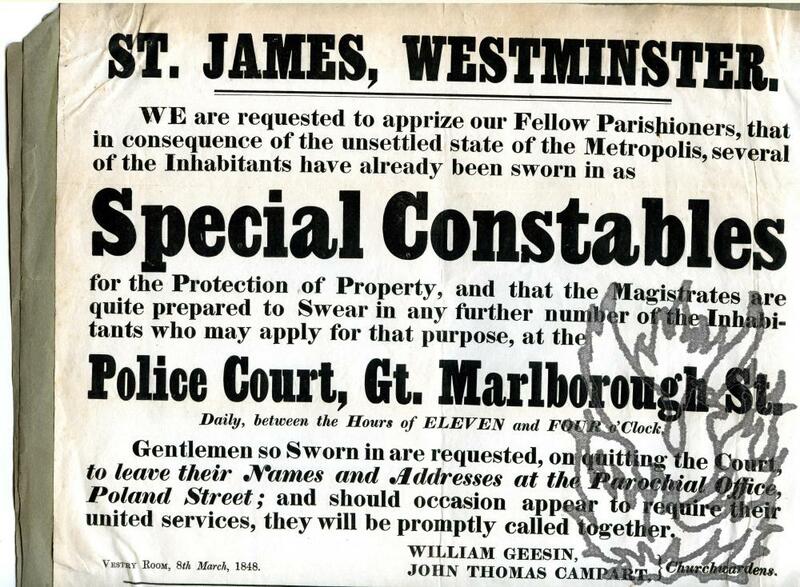 Five items relating to the appointment of Special Constables, 'in consequence of the unsettled state of the Metropolis', including a signed warrant appointing Cater a Special Constable, as 'a tumult or riot may be reasonably apprehended'. The five items produced between March and June 1848. One of them printed by T. Brettell, Rupert Street, Haymarket. A collection of items indicating the panic felt by the bourgeoisie around the time of the Great Chartism Meeting on Kennington Common, 10 April 1848. Items Two to Five are laid down on a piece of grey paper removed from a scrapbook. 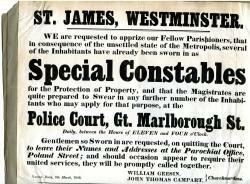 Item One: Printed warrant signed by two magistrates, appointing Cater a Special Constable, it appearing, 'upon the oath of a credible witness, that a tumult or riot may be reasonably apprehended'. On one side of a piece of laid paper roughly 320 x 210 mm. Watermarked 'W H FELLOWS 1847'. Autograph Letter Signed ('Katharine S. Macquoid') to Seymour C. J. Freeman-Matthews. One page, 12mo. Very good. 'I see that to-day is mail day for the Cape, I therefore send you at once the signature for which you ask. I wonder how you discovered my address.' Accompanied by biographical cutting. A Representation of the Tables in the Body of Guildhall, and the Old Court of King's Bench, with the arrangement for the members of the Court of Common Council and their ladies. Lord Mayor's Day, 1838.